SANTA CLARA, Calif. — At RoboBusiness 2017 here earlier this fall, the keynote speakers provided their personal insights into where the automation industry is headed and what still needs to be done. Melonee Wise, CEO of Fetch Robotics Inc., shares her thoughts about robotics and AI for logistics with Managing Editor Steve Crowe in the brief video below. Among her other experience and accolades, Wise was manager of robot development at Willow Garage. She was also the closing speaker at this year’s RoboBusiness conference and expo. San Jose, Calif.-based Fetch makes mobile robots for warehouse and other environments. 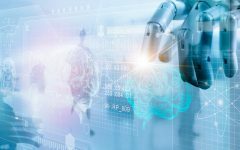 In addition to industrial automation, Crowe notes that Fetch has been working recently with research institutions on robotics and AI for logistics and other applications. Fetch’s platform is robust because it was designed for commercial applications. “We’ll be targeting it for more specific applications in the next two years [such as] machine tending, cell operations,” Wise says. The company is focusing on broadening its market because there’s “a big need; it’s a good cross-section of our customer base,” she says. Among the conference participants was a Fetch Robotics end user, says Crowe. Cindy Traver, senior director of operations at RK Logistics Group Inc., spoke about “Creating a Winning Team — Moving From Discrete Investments to Enterprise Scale” during the Chief Robotics Officer (CRO) Network Summit preceding RoboBusiness 2017. Traver was also in a session on “How We Increased Our Revenue With Robots,” in which she discussed RK Logistics’ use of Fetch robots and what it overcame to obtain returns on investment. Crowe mentions a Forbes article describing Fetch’s use of Skymind’s tools as an example of AI for logistics. “We’re looking at AI, machine learning, or deep learning and the many ways it can help improve capabilities to do things quickly and be relevant to big data sets,” Wise replies. AI for logistics can also lead to “nascent behaviors,” so robots can do certain things if they encounter a robot or a person, she says. Crowe asks Wise if she has advice for young women looking to get into robotics. “It’s important for parents, mentors to build that confidence — that’s true for men and women,” Wise says.